I don’t even know where to start. I loved this book so much, it’s left me grasping for the words to explain how much I loved it. First of all, I love Augusten Burroughs. Ever since I read Running with Scissors many years ago, I’ve loved him. I quickly followed Running With Scissors with Dry and Magical Thinking and came to love him even more. He is the very first author I ever wrote a fan letter to (and he responded). There’s just something about the things he writes about and how he writes – dysfunctional, funny, ironic, devastating, and brutally real and honest. This Is How is no exception, although it’s not really at all what I expected. I’m not sure what I expected. 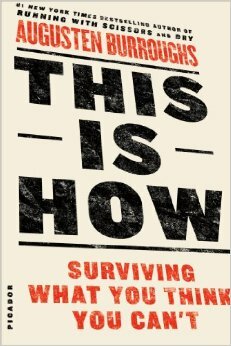 I’m not a fan of self-help books, but coming from Augusten Burroughs I knew this wasn’t going to be your garden-variety self-help book. I didn’t even buy it looking for help or answers or solutions to anything at all – I just wanted to read another book written by him. As it turns out, This Is How kind of got under my skin and shook me up, but good. It is truly a no-holds-barred manual on how to live. I know that sounds corny, but there it is. And who the hell is Augusten Burroughs to write a book on how to live? With chapters like “How to Feel Sorry For Yourself,” “How to Fail,” “How to End Your Life,” “Why Having it All is Not,” “How to Finish Your Drink,” and “How to Lose Someone You Love,” to name only a few, Burroughs talks about depression, low self-esteem, anger, suicide, alcoholism, abuse, getting over the past, and a myriad of other life topics that, really, touch every single one of us. At its core, it’s about going on when you think you can’t, and it’s about stripping everything down to its essential truth – in other words, stop bullshitting yourself. I laughed, I cried, and shook my fists, and I devoured this book, highlighter in hand, in three days. I finished it feeling changed on some level. I want everyone I care about to read this. I am giving a copy to my 18-year old son. Read it. Seriously, read it. just requested it from the library; thanks! I finished “My Notorious Life” by Kate Manning. You might like it! I really enjoyed it–check it out on Goodreads maybe. A well-written historical fiction tome. “My Notorious Life” has been on my to-read list for a while! I guess I’ll have to read it sooner than later. I read Running with Scissors years ago and found it to be a page-turner. Gosh! So many good books to read and so little time! You’ve made me so curious abouth this one.